Swansea Astronomical Society senior observers, Gaynor Thomas and Steve Wainwright represented the SAS at the official opening of the Usk Astronomical Society Observatory. The observatory is a Canadian built Skyshed Pod with two additional extension pods to house desks. 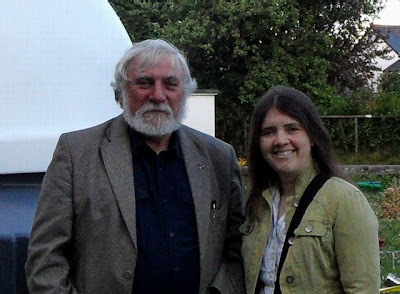 The event was attended by civic dignitories and an inspiring speech was given by Prof. Mike Edmunds of Cardiff University on the relationship between amateur and professional astronomers. The ribbon was cut by Dr Paul Roche, the Schools Astronomer with the Faulks Telescope Project. This observatory is an example of something sadly lost to Swansea, where civic authorities and an astronomical society work together to form something of value to the culture and education of the community. Usk astronomical society have an outreach program at least as ambitious as the one that was brought to a shameful end in Swansea with the loss of the Marina Towers Observatory which now stands derelict, where it used to inspire local school children to pursue science. Usk have spawned another astronomical society at Abergavenny and are proving that when they have civic cooperation, they can add much more value to the local culture and education than they take out. The new Usk observatory is called the 'Alfred Russel Walace Observatory'. It is so named for the man, born in nearby Llanbadoc. Wallace independently developed the theory of Evolution and prompted Charles Darwin to publish his findings and ideas in 'The Origin of Species'. The observatory is sited in accessible grounds in a very friendly environment in Usk. Usk AS will go from strength to strength now that they have a fine observatory in which to make their observations and in the grounds of the building where they hold their meetings. Note that the brightness of the filament remains the same when it becomes a prominence. The sunspots AR1203 and 1204 are joined by a small, spot near the eastern limb.